Trade shows may look like a lot of hassle to attend, but they’re actually a very effective marketing medium. And trade show booths can play a huge role in your business’s overall marketing strategy. With the right booth, you’ll eventually find that investing in trade show exhibits is well worth your money. According to the Center for Exhibition Industry Research, 82% of trade show attendees have the power the buy something during the event. The opportunity to come in contact with that many decision-makers in a single place does not happen as often, so it’s important that your business comes in prepared to convince them that you have what they’re looking for. And you can do exactly that with an impactful and an impressive trade show booth that can represent you with a sense of prominence. Salient Sign Studio is a signage provider that specializes in trade show booths that are custom-crafted to suit your business’s brand message, timeline, and budget. 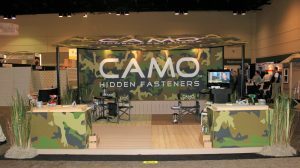 We design, fabricate, install, and repair trade show displays of all various types, sizes, materials, and layouts and we’re confident that we have the right one for you. Fully customized trade show exhibits by Salient Sign Studio give you the freedom to have your booth made exactly the way you want it. You can choose the design, material, construction, and arrangement of your booth elements so that your entire exhibit reflects your business’s unique personality. Each booth element is fabricated specially for your brand. Salient Sign Studio creates trade show booths as small as 10’x10’ and as large as 30’x30’. We also fabricate various materials like wood, acrylic, fabric, vinyl, aluminum, glass, steel, etc. All this so that you can give your visitors and customers an unforgettable experience. Although this type of trade show exhibit is usually costlier than others, it also offers the greatest potential to stand out, get noticed, and bring in more footfall. 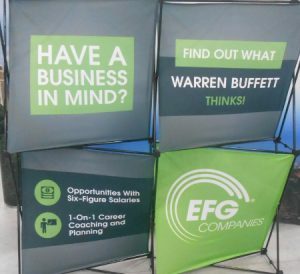 If your company is an active trade show marketer and participates in a number of events every year, then fully customized exhibits are worth every buck and can actually be more impactful, more cost-effective than generic booth rentals. Prefabricated trade show kits are the simplest option for trade show exhibits. They’re pre-built booth systems that are ready for installation and they’re the most economical way to go. Prefab kits come with a specific set of booth elements that you can assemble and set up at the event. Salient Sign Studio offers a number of prefab trade show booth packages to choose from for your ideal booth size. We can quickly get those over to you so you can start prepping for your event. 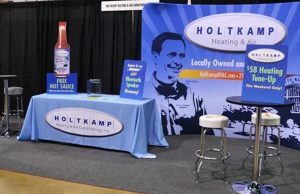 Compared to fully custom-made trade show exhibits, prefab kits by Salient Sign Studio may not give you as much flexibility, uniqueness, and variety when it comes to setting up your booth, but with the right design and great layout, they are still pretty effective when it comes to trade show marketing. And in the long run, they’re still more cost-effective than renting out a booth. Modular trade show booths are an awesome mix of the first two types. 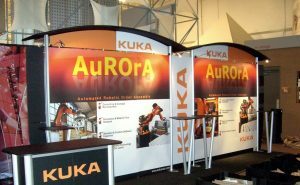 They are trade show exhibit systems made of various prefabricated elements but, because these elements are interchangeable, they also have a degree of the flexibility and uniqueness that fully customized booths offer. Modular exhibits by Salient Sign Studio allow you to create many designs with all sorts of textures, which allows you to set your booth up in a way that conveys your brand message clearly and cohesively. We also make it easier for you to literally set up your booth because we source durable but lightweight materials that can easily be assembled by your staff. And if you have issues with setup, we at Salient Sign Studio are here to help you out. 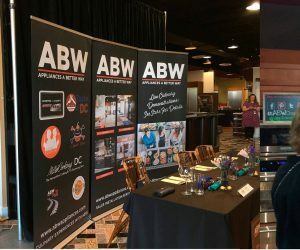 Salient Sign Studio has been a trusted local provider of trade show booths for a long time now, so we know how important it is for business owners get the exhibit that they need and want. And this is exactly what we’re all about. So before we do anything, we first make sure that we know what your business is about, what your objectives are, what your expectations are, what your timeline is, and how much you are willing to spend for your trade show exhibit. If you already have ready-to-print designs in hand, our wide format digital printers can bring them life. And if you don’t, don’t worry, our in-house graphic artists can help you out. In fact, our entire team of project managers, sign specialists, engineers, and graphic designers are ready to help each client out from start to finish. Coming up with a high-impact trade show exhibit is a big challenge, but that’s what Salient Sign Studio is here for! We’re here to make the selection, design, and installation processes a lot easier for you. So whether you need a fully customized trade show booth, a prefabricated package, or a modular system, we’ve it for you and we’re ready to help you out. We’d also be happy to sit down with you for a free consultation. We’ll discuss what your business needs are and what we can do to help you achieve them. Call Salient Sign Studio today at (313) 314-3677 for your Free Consultation with a Tradeshow Expert!